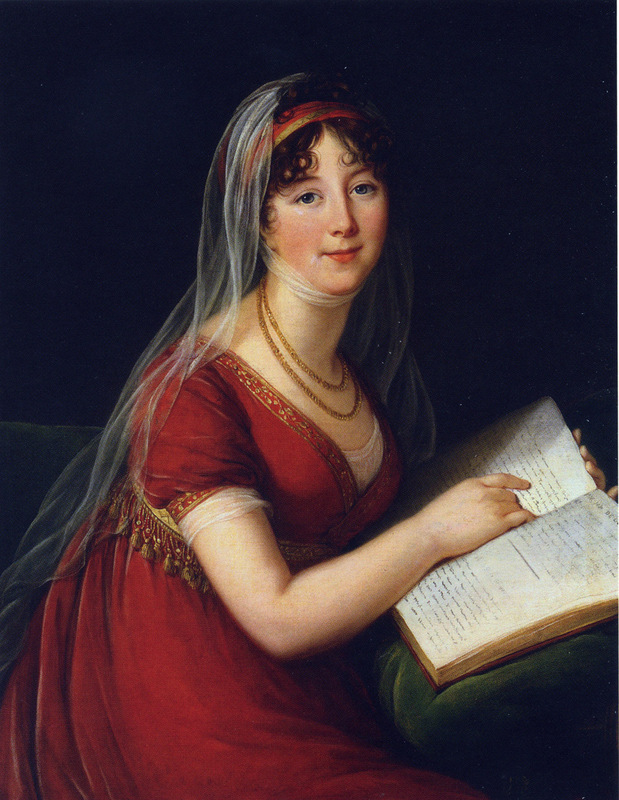 Vigée Le Brun painted Madame Varvara Ivanovna Ladomirsky, later Narychkin (May 17, 1785, died November 26, 1840) in Moscow in 1800. 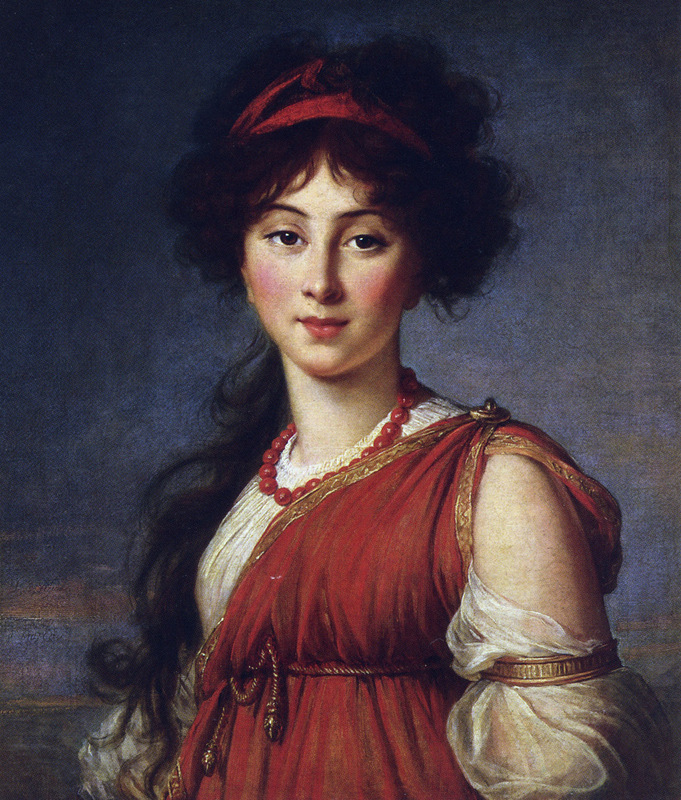 The "perfectly Greek" features of this young woman encouraged the artist to dress the sitter in a classically inspired costume. 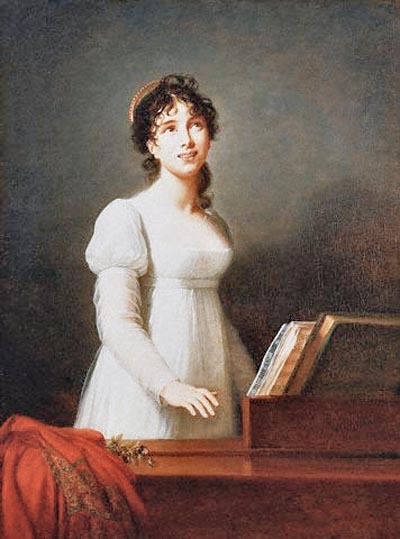 She married Ivan Dimitrievitch Narishkin (born April 17, 1776, died April 15, 1848). 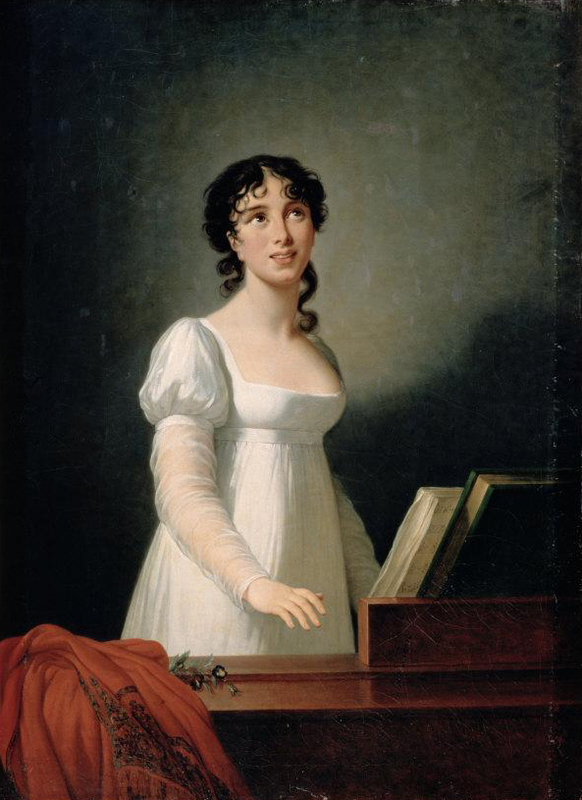 Her parents were Ecaterina Petrovna Stroganoff, nee Princess Troubetskoy (1744-1815) [the estranged wife of Count A.S. Stroganoff, whom Vigee Le Brun painted when she was very young (Art Page 99) and her lover, Ivan Nikolaevitch Rimsky-Korsakoff. The four children of this union were granted the name of an extinct noble Polish family, Ladomirsky. Reference Kimbell Exhibition Catalog Number 51 for more details. This portrait was displayed in the 2015 Paris Exhibition. I received a note from a close relative of Madame Narishkine: "On your page there is a portrait of my great-great-grandmother Varvara Ivanovna Narishkina nee Ladomirsky, you wrote that she married Prince Narishkin. This is erroneous. The Narishkins never were princes, even though our social rank is higher than that of princes. Indeed, we have always refused titles - there were one or two exceptions who accepted the title of count, but it is a point of honour in our family not to accept titles. As our forefather stated - "The czar can make all the princes, barons, dukes, counts, that he wishes, but he cannot make a Narishkin". Please remove the reference to "Prince" and include Ivan Dimitrievitch in its stead. My great-great-grandmother married my great-great-grandfather Ivan Dimitrievitch Narishkin. Their son was my great-grandfather Dimitri Ivanovitch Narishkin, and their daughter was Zinaida Ivanovna Narishkina who married Prince Yusupov and was the great-grandmother of Prince Felix Yusupov, my cousin.The beautiful Varvara had a horrible accidental death as a result of a building fire. On a more cheerful note, it was Varvara who brought the beauty genes into the Yussupov family and added some to the Narishkin family. Best regards,Vera Vadimovna Narishkina". Mrs. William Chinnery, née Margaret Tresilian. Reference Kimbell Exhibition Catalog Number 53 for more details. This portrait was displayed in the 2015 Paris Exhibition. Previously owned by the Kimbell Art Museum, Ft Worth Texas. Sold July 5, 1989 at the Sotheby's Old Masters Sale, London. Present owner is unknown. Another version of this painting on Art Page 178 is at the Arkhangelskoe Estate outside of Moscow, Russia. The image of this painting at the Arkhangelskoe Estate appeared in a 1983 book confirming that it is a different version of the previous Kimbell Museum painting. Reference Kimbell Exhibition Catalog Number 54 for more details.